Oct 9: Madgets on ComputerBase (in German). Oct 6: Presented full paper at ACM UIST 2010. Aug 3: Madgets on EnGadget and Gizmodo. Madgets are magnetic widgets for interactive tabletops. Like SLAP widgets, they provide the rich haptic feedback of tangible controls and use the table's rear-projection to change their visual appearance. In addition, permanent magnets attached to their base enable their flexible actuation. As low-cost, untethered, and easy-to-build controls, Madgets help maintain consistency between physical controls and their internal digital state, or to synchronize physical controls on tabletops between users at two remote locations. Our interactive Madgets tabletop combines electromagnetic actuation with fiber optical tracking. Unlike previous actuation approaches, our algorithm decomposes complex controls into multiple rigid bodies that are linked by joints. Beside arranging objects on the table, we make use of new actuation dimensions, such as height, vibration feedback, and power transfer. A grid of fiber optics lets cameras beneath the table see past the actuation hardware. Our tracking algorithm then detects Madgets and finger touches on the tabletop. Madgets is a research project by Malte Weiss, Florian Schwarz, Simon Jakubowski, and Jan Borchers from the Media Computing Group. It is funded in part through the German B-IT Foundation. Thanks to Helga Isenberg, Lucas Braun, Christian Remy, and Simon Voelker for the help to build the system. Special thanks to Patrick Baudisch for his valuable input to our UIST paper. Thanks to Stephan Ortmanns for designing the logo. Malte Weiss, Christian Remy and Jan Borchers. Rendering Physical Effects in Tabletop Controls. In CHI '11: Proceedings of the twenty-ninth annual SIGCHI conference on Human factors in computing systems, pages 3009–3012, ACM Press, New York, NY, USA, 2011. Malte Weiss, Florian Schwarz, Simon Jakubowski and Jan Borchers. Madgets: Actuating Widgets on Interactive Tabletops. In Proceedings of UIST '10, pages 293–302, ACM Press, New York, NY, USA, 2010. Malte Weiss, Florian Schwarz and Jan Borchers. 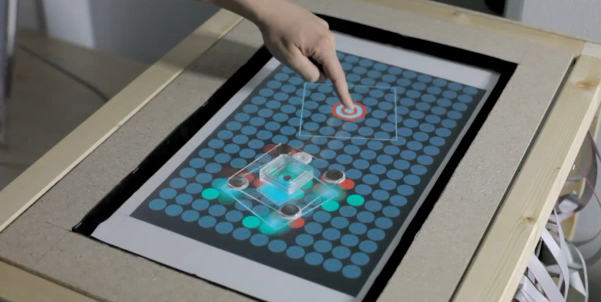 Actuated Translucent Controls for Dynamic Tangible Applications on Interactive Tabletops. In ITS '09: Extended Abstracts of ACM International Conference on Interactive Tabletops and Surfaces, ACM, New York, NY, USA, November 2009.